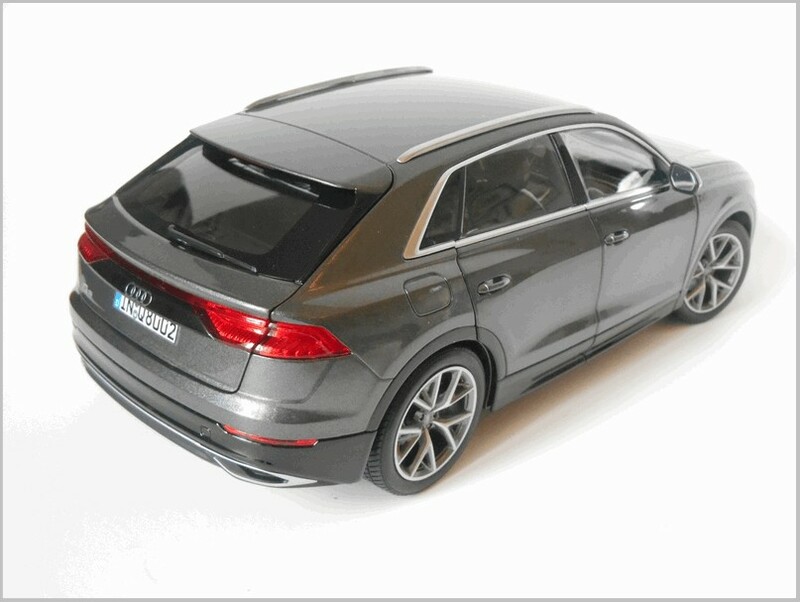 Here are a few more 1:18 scale promotional models which Santa Claus’ found in his bag for my collection, Audi this time, and once again by Norev. 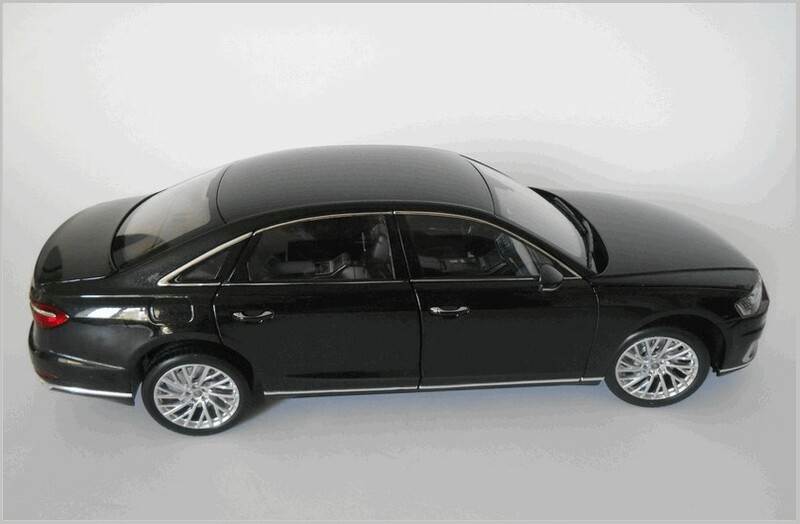 As usual the models’ bodies are diecast in metal with the usual additional plastic components, all hand assembled in China. 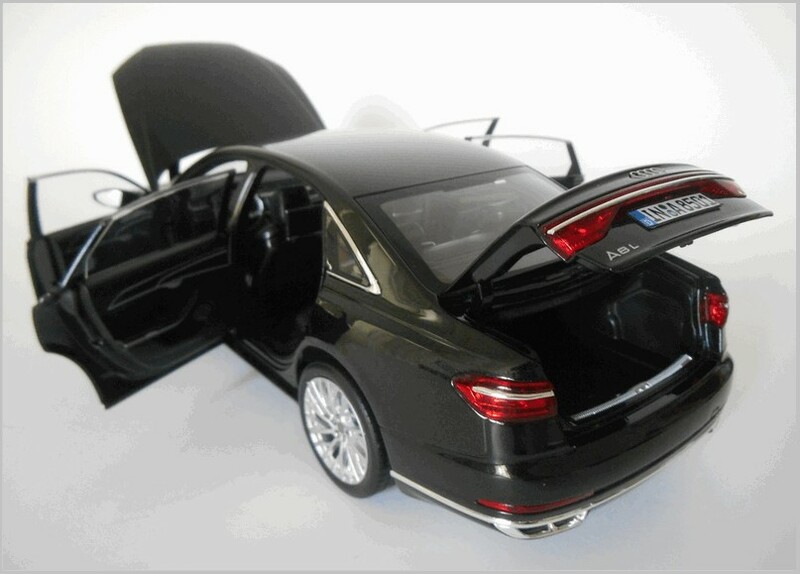 Engine and chassis are faithfully reproduced, with rich interiors, and a deep paint finish. 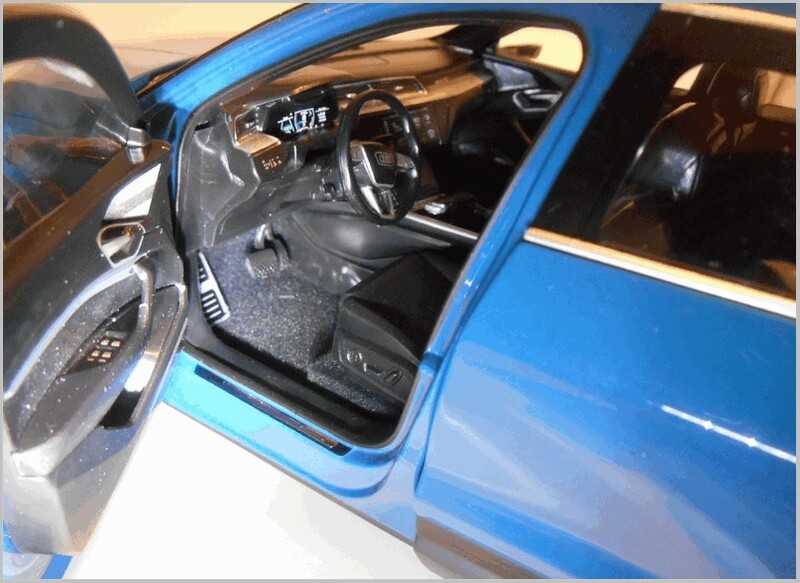 All four doors can be opened, as can the bonnet (hood) and the boot (trunk). Here are some more beautiful models to add to your collection. The scale model (code no. 501.17.080.51, finished in Myth black metallic) is based on the L (long) version of the car. A nice model, but compared to similar promotional models made by Norev for BMW or Mercedes-Benz, it seems to be less detailed and made to a lower budget. Safety belts are missing (there are only the buckles), the boot (rear trunk) isn’t flocked, and the usual screwdriver and soft tissue are missing. 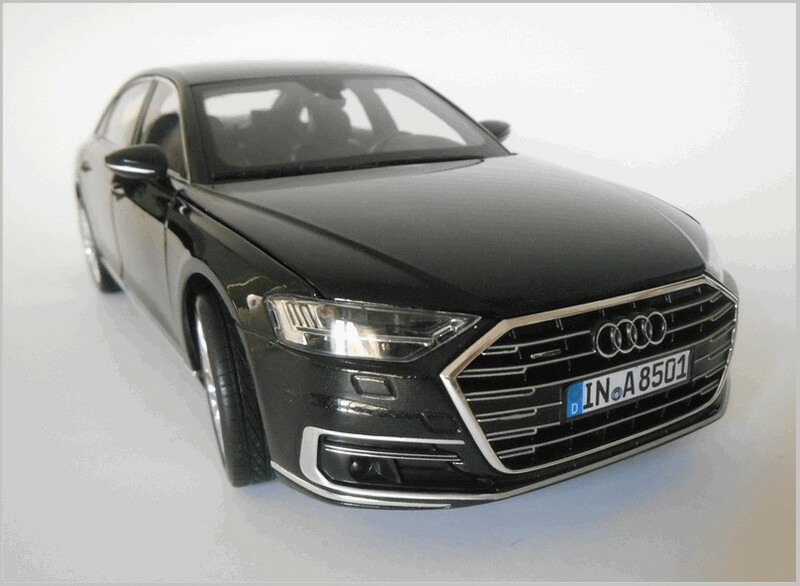 No need to introduce the A8, flagship of the “four rings” brand, now in its fourth generation. 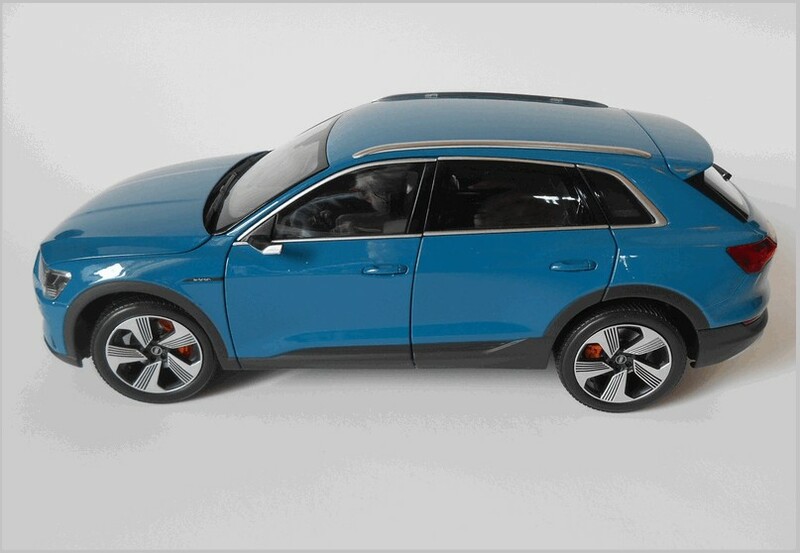 Unveiled to the public at the 2017 Frankfurt Motor Show, it is based on the Volkswagen Group MLB-evo platform ( like the Lamborghini Urus or the Bentley Bentayga), This is not a real physical platform but a strategy for its vehicles with longitudinal engine orientation (Modularer Längsbaukasten), based on the uniform positioning of all motors and transmissions in order to cut down on engineering costs and weight/complexity. 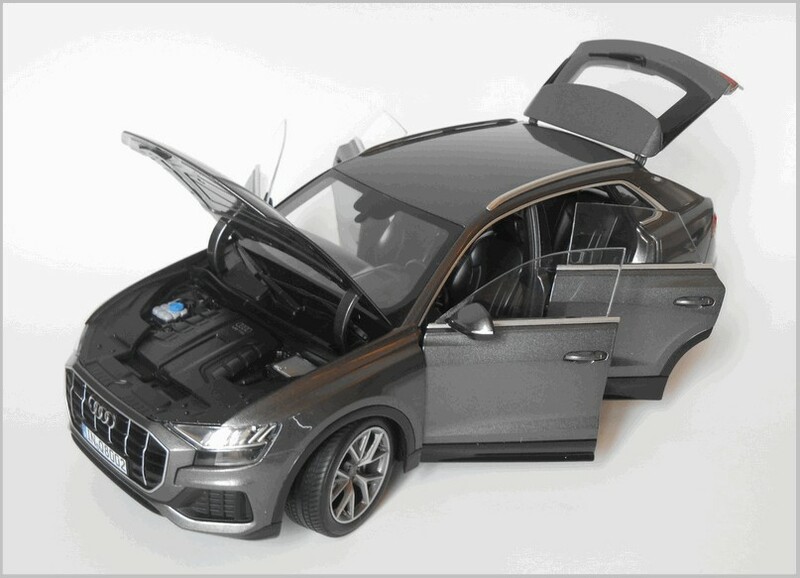 In a few words it creates a standardised, interchangeable set of parts from which to build a wide variety of cars. As in previous generations, it retains the Audi Space Frame aluminium construction method co-developed with Alcoa. Available with V6, V8 and W12 petrol and V6 and V8 diesel engines, all cars feature all-wheel drive and an 8-speed Tiptronic automatic transmission. Produced at the Neckarsulm plant, exterior styling is similar to the previous generation, the real changes are inside, with a virtual cockpit and touchscreen controls replacing the old knob between the seats. One new feature (not available in USA) is the “Traffic Jam Pilot”, consisting of level 3 autonomous driving at speeds up to 60 km/h when on a highway. A beautiful set of wheels, indeed. The new Q8 is a full-size luxury crossover SUV coupé, at last a direct competitor to the BMW X6 and the Mercedes-Benz GLE-Class Coupé. 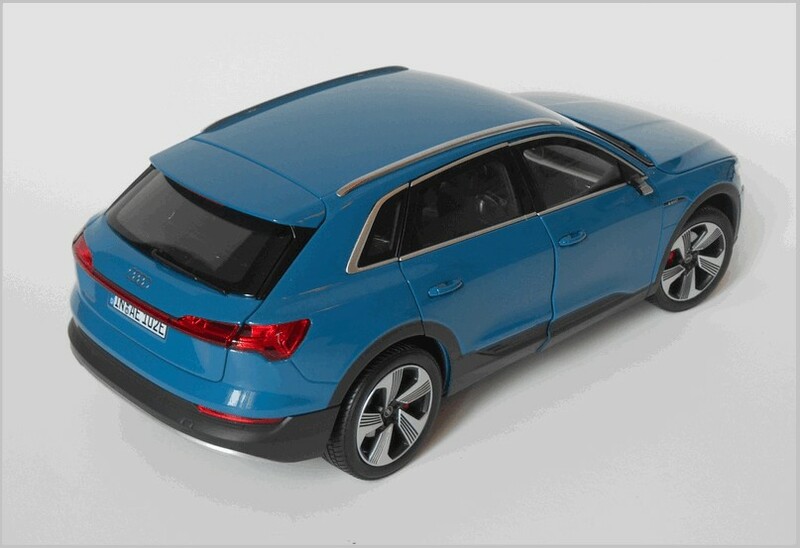 Audi clearly preferred to wait and see if the new bodystyle became a sales success for other brands. Nowadays SUVs are increasingly popular in the luxury segment and very likely the Q8 will sell in higher number than the A8. Produced at the Volkswagen Bratislava plant, like the current A8 it is based on the MLB-evo platform, and introduces a new design for the brand’s SUVs, with a larger octagonal grill, plus full-laser headlamps and tail lamps. Inside it features an enlarged virtual cockpit and three touchscreens. 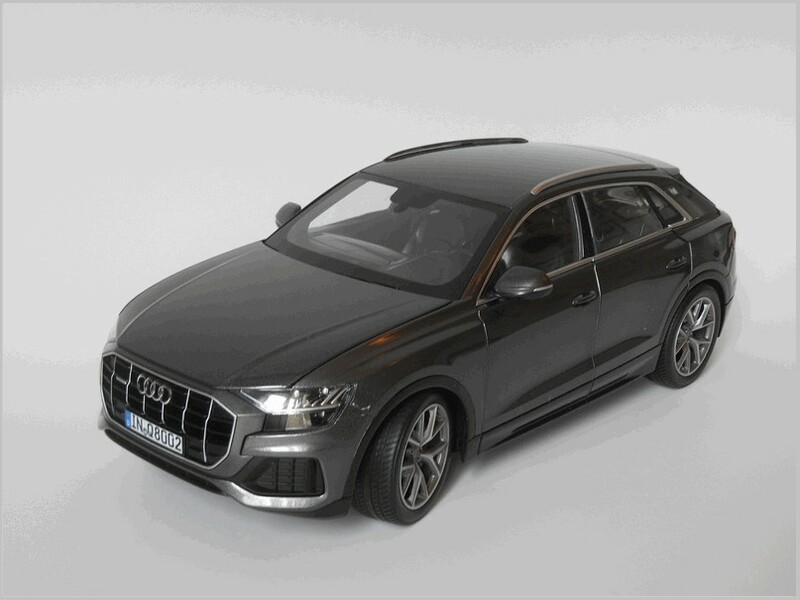 Compared to the Q7 it is slightly shorter (in terms of both length and height) and wider, with less cargo space and lacking the third-row seats, yet with a near 2,200 kg weight. Available with a V6 petrol engine or a V6 diesel, featuring a mild hybrid technology, with all-wheel drive and an 8-speed Tiptronic automatic transmission. Later there will be a V8 twin turbo with over 600 hp. The scale model (code no. 501.17.086.51, in Samurai grey) is based on the V8 TDI version, and has the same minor shortcomings seen on the A8 seen above. The e-tron is the first example of the Audi new electric age. 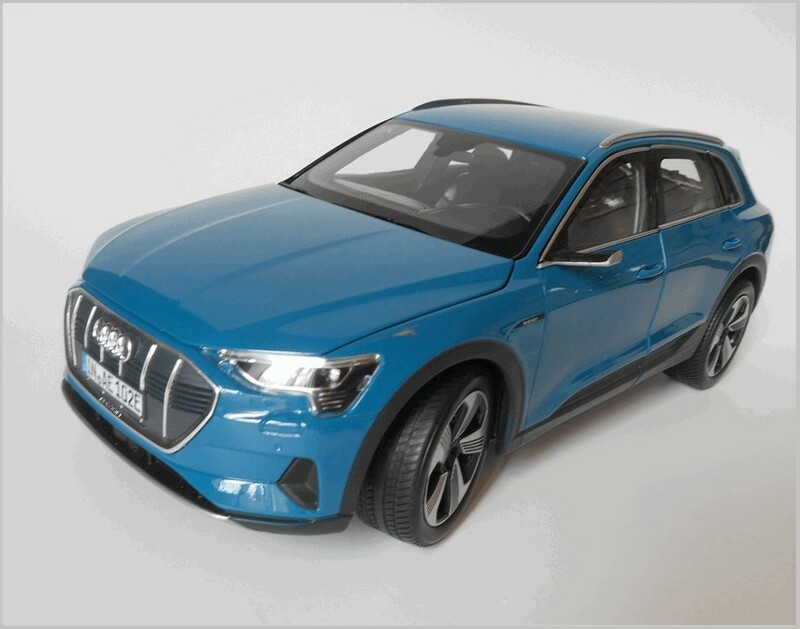 Head of what will be a large family, it represents the debut of the “four rings” brand in mass-production of electric vehicles. Another muscular SUV, all-wheel drive, two asynchronous engines, a peak power of more than 400 hp and a claimed 400 kilometres range. But with a weight of over 2,500 kg (more than 3,100 kg at full load), and a length near to five metres, I’m wondering if it is really what we need to save our planet. Exterior styling is marked by the shoulder line and the virtual rear view mirrors, and it has an exceptionally low drag factor. The interior is essentially minimalist with the virtual cockpit and two touchscreens. It is produced at the Bruxelles plant. 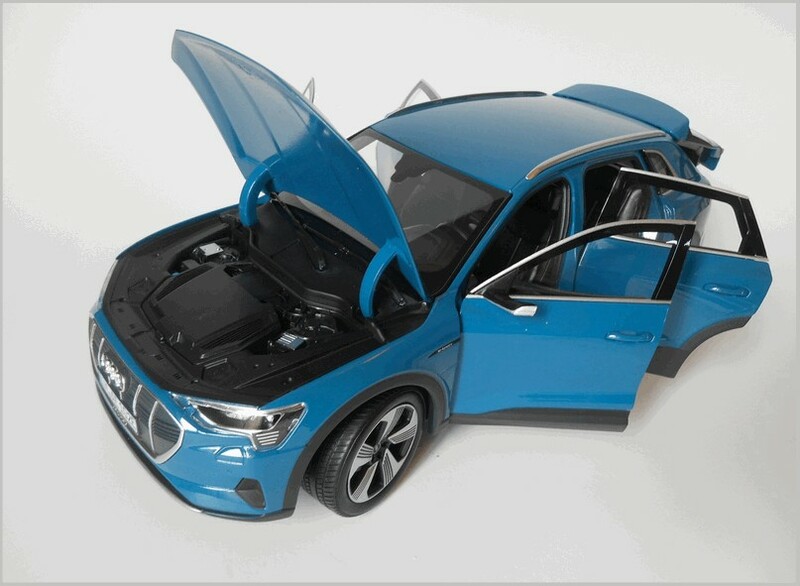 According to some reviews the e-tron is more oriented to comfort than handling, easy to understand given the weight. It is also heavily handicapped by the lack of the necessary infrastructure for electric vehicles almost everywhere. A beautiful toy for rich people, but not a practical solution to our general needs. The scale model (code no. 501.18.206.51, in Antigua blue) actually has a flocked rear trunk. So thee are beautiful models, but with minor imperfections. But I question whether there should be such imperfections on so expensive models?